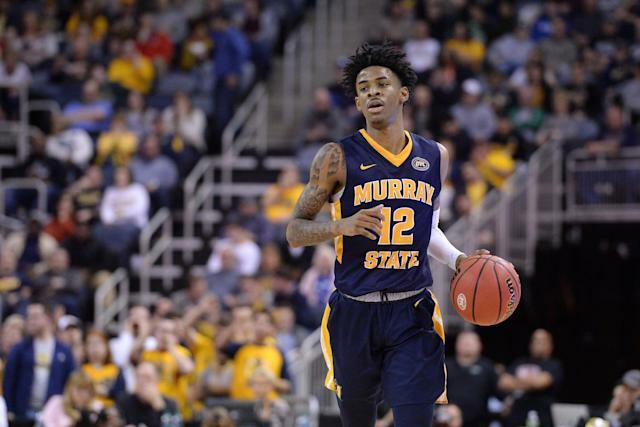 HARTFORD, Conn. – Murray State point guard Ja Morant is an embryonic Russell Westbrook, the season's small-school delight who is putting up both pinball scoring numbers and historic assist totals. 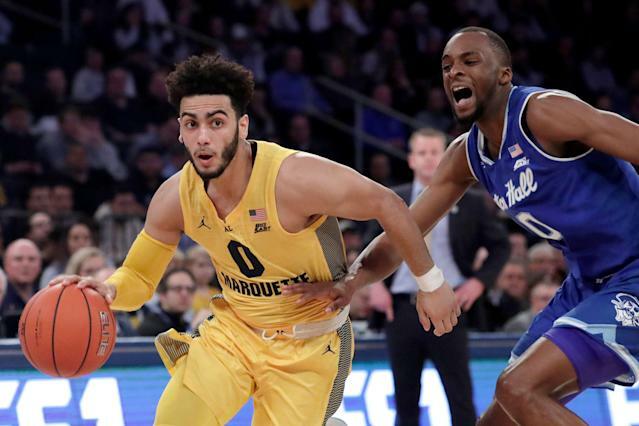 Marquette guard Markus Howard is a miniature Steph Curry, as he's popped off six times this season for more than 35 points. Morant (24.6 ppg) and Howard (25.0) are two of the country's top-10 scorers, the only members of that list to be playing in the NCAA tournament. And they just happen to be playing each other. For NBA executives, hoops junkies and the fans who leave work for lunch on Thursday and don't plan to return, it's the sexiest matchup of the opening round of the NCAA tournament. "I really don't think it's a Ja Morant versus Markus Howard," Morant said. "I think it's Murray State versus Marquette. That's how we're going to take it." Well, he's the only one. While downplaying the individual matchup is a predictable pre-game trope for coaches and players, there is a pinch of bad news. When No. 12 Murray State plays No. 5 Marquette on Thursday afternoon, the tournament's best individual matchup will likely feature two players who aren't actually guarding each other. And that invites into the spotlight two defensive stoppers suddenly tasked with the biggest assignments of their career. While tuning in for Morant vs. Howard, fans are going to meet Murray State defensive ace Shaq Buchanan and Marquette stopper Sacar Anim. Both relish their supporting spot opposite the players who'll draw the CBS klieg lights, despite the trail of hapless defenders Morant and Howard have left in their wake. "I get to showcase my defensive skills," said Murray State's Buchanan, the Ohio Valley Conference Defensive Player of the Year. "Guarding an elite scorer like him will be great." Marquette's Buchanan concurred: "It's a huge opportunity. Playing against a top-three projected player in the NBA draft. You don't get to do this every day." Matt McMahon, head coach of Murray State (27-4), puts Morant's historic season in perspective with a simple statistic. He's averaged 24 points and 10 assists per game this season. He said only 16 players across the country have done that in a single game this season. "That's what he averaged this season," McMahon said. "So he's had a magical year and is very deserving of all the awards that come his way." Marquette coach Steve Wojciechowski stressed the obvious talking point of not overlooking the rest of Morant's teammates. "Murray State is not in this position because it's a one-man show," he said. But they're also relying on Anim, a 6-foot-5 redshirt junior, to make sure Morant's lead performance isn't a virtuoso one. Marquette assistant coach Dwayne Killings pointed out the importance for Anim to limit Morant early in the game, especially in transition. Marquette doesn't mind playing uptempo, but the Golden Eagles will use their offense to dictate the pace of the game. "We need to take care of the ball and take good shots," Anim said. "The last thing we want is to get them in transition early and [them] get the momentum." Killings pointed out how good Morant and Murray are around the rim, which means it's important to limit momentum plays like run-outs and alley-oops. But it's clear where Marquette's defensive gameplan will be focused. "[Morant] is the head of the snake," Killings said. "He makes all those guys better." Marquette (24-9) comes wobbling into the NCAAs, as they've lost five of six games. Howard shot 1-for-15 from the field in their last loss, a technical-marred slobberknocker against Seton Hall in the Big East Tournament. America is skeptical of the Golden Eagles, as more than 40 percent of the participants in the Yahoo Sports Tourney Pick'em game have chosen Marquette to lose. That's the most popular 12-5 upset pick, and a testament to both Morant's star power and Marquette's downshift from Final Four darkhorse to Thursday happy-hour participant. For Murray State to prove America right, they'll need Buchanan, a 6-foot-3 senior junior college transfer, to properly hound Howard. Murray State assistant Casey Long said they've scouted Howard as a three-level scorer who has faced and solved every possible defensive challenge in the Big East this year, including blitzing, hedging and switching on ball screens. Buchanan offered this scouting report of how he plans to attempt to slow Howard: "Blow up ball screens, don't go under any screens," he said. "Make him finish over our height and don't give him any open looks. Seton Hall pressured him and denied him the ball and made him work for everything he got." Buchanan's length, according to the Murray State staff, gives him a wingspan of nearly seven feet on his 6-foot-3 frame. He also has 10-inch hands, which is something out of a Mel Kiper/Josh Allen fever dream. Will those physical tools allow him to corral Howard? America will be watching Anim and Buchanan closely on Thursday afternoon, even if that's not who they're tuning in for.